» High quality reproduction of the 1603 map "Descripcion del Reyno de Galizia" (A Description of the Kingdom of Galicia), made for the Count of Lemos, Pedro Fernandez de Castro Francesco, by Galician cartographer Fernando Ojea. 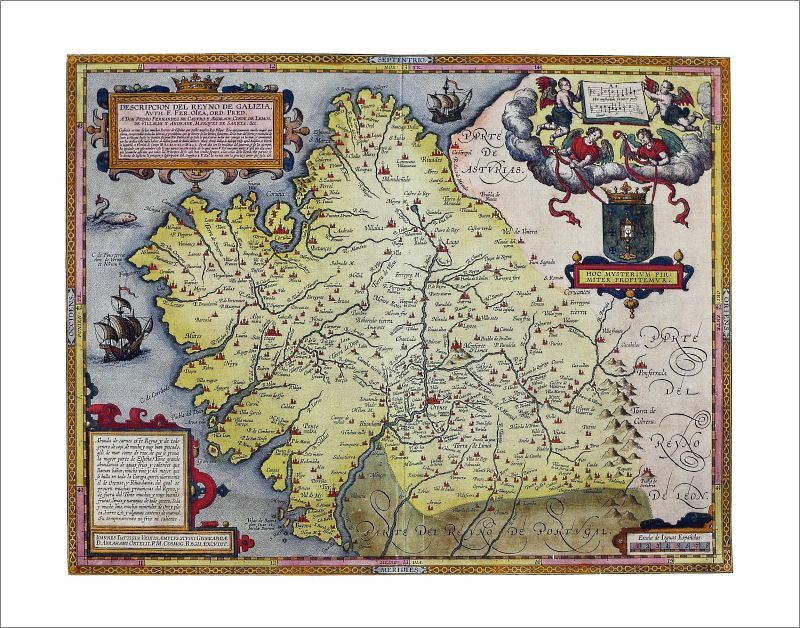 One of Galicia's most popular old maps, made by the Galician cartographer Fernando Ojea (1560-1615) around 1600-1603, it was engraved in Antwerp -The Netherlands- at the workshop of the famous mapmaker Joannes Baptista Vrients. Ojea's map was featured in the world's first modern atlas, Abraham Ortelius' Theatrum Orbis Terrarum. Ojea's map is often credited with causing a change in the national Coat of Arms of Galicia. Historically, the Galician arms featured the Holy Grail over a blue field semé of crosses. In his map, Ojea featured a brand new variation of the traditional Coat of Arms including just six crosses on the field, three on each side of the Grail. From here onwards, Galician illustrators and scuptors started adopting Ojea's new design and the traditional field semé of crosses was eventually abandoned. In reference to Galicia's Holy Grail, Ojea also introduced a motto under the Coat of Arms, "HOC MYSTERIVM FIRMITER PROFITEMVR" (We Firmly Believe in this Mistery), which again was reused by a number of other illustrators as a motto for the national arms of Galicia. "Galicia is one of the many kingdoms of Spain in the possession of our king Philip. It used to be much larger than it is now, and contained all the lands and provinces within the following borders: from the Northern Sea and the mountains close to Bizcaya up to the spring of the great river Douro, and all the land between this area and the sea". "Nowadays, with changes in government and time, what remains of its territory is just what is shown on this map of which His Excellency has the greater part, and therefore, for the great affection which all the lords from his house have always had for all matters concerning their kingdom, it seems to me that in doing justice to the description which is offered to His Excellency, it will be received with grace and love". "This kingdom has plenty of meat and venison, and much excellent fish, both from the sea and the rivers, which is supplied to most parts of Spain. It has a great abundance of hot and cold springs which are called baths, and much wine, some of the best found in all of Europe, particularly from Orense and Riva davia, which is provided to many provinces of the kingdom, and it is also exported. It has many and excellent fruits of all kinds, silk and much linen, much gold and silver, iron and some marble quarries. Its temperature is not too cold, nor too hot."